Habit: Shrub. Stem: decumbent to erect, slender. Leaf: simple, deciduous, short-petioled; blade generally elliptic to round, some often +- lobed. Inflorescence: generally raceme, generally +- terminal, generally few-flowered; flower subtended by 2 fused bractlets. Flower: +- radial; hypanthium +- spheric; calyx with 5-toothed, persistent limb; corolla bell-shaped to +- salverform, generally 5-lobed, white or pink, often +- hairy inside; nectary glands 5, +- basal; stamens generally included; ovary chambers 4, styles generally included, stigma head-shaped. Fruit: drupe, generally berry-like, white to pink. Seed: 2 (1 per lateral ovary chamber), +- oblong, planoconvex. Habit: Plant erect, 6--18 dm, glabrous or puberulent. Stem: branches stiff, spreading; new shoots erect, unbranched, often with inflorescence and larger, more variable leaves. Leaf: blade generally 1--3 cm, to 6 cm on new shoots. Inflorescence: flowers 8--16. 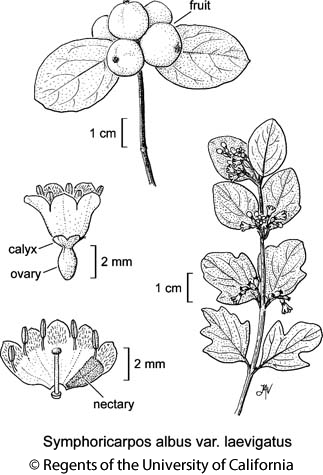 Flower: calyx limb +- spreading, divided 1/2; corolla 4--6 mm, bell-shaped, pink, swollen on 1 side, with 5 nectary glands within swelling, lobes +- 1/2 corolla, +- erect, lobes and upper throat +- densely hairy inside. Fruit: 8--12 mm, round. Seed: 4--5 mm. Citation for this treatment: Charles D. Bell & Lauramay T. Dempster 2012, Symphoricarpos albus var. laevigatus, in Jepson Flora Project (eds.) Jepson eFlora, http://ucjeps.berkeley.edu/eflora/eflora_display.php?tid=66912, accessed on April 22, 2019. NW, w edge CaR, n SNF, CW, SW; Markers link to CCH specimen records. Yellow markers indicate records that may provide evidence for eFlora range revision or may have georeferencing or identification issues. Purple markers indicate specimens collected from a garden, greenhouse, or other non-wild location.